Only at OPTP, the new orange Franklin Smooth Ball™ Set is designed to comfortably massage even the most sensitive user. Their smooth surface provides deep muscle penetration that goes to the source of the trigger point without aggravating soft tissue. Approximately 4" in diameter. Set of two. Latex- and phthalate-free. These balls go everywhere with me. I use them on the airplane, with my clients, and while I&apos;m relaxing at home. They are easy to travel with and come in handy wherever you are helping you release tension and find softer, easier muscles with very little effort. Happy I found this. Great tools for self-massage. Most of my clients who try them buy a pair, in fact, I don&apos;t think anyone who has tried them hasn&apos;t. When I find something that works I tell everyone! Also I&apos;ve found these can often be included in "warm ups" (as per Franklin books) and so the different uses make them a worthwhile purchase. A few of my clients are coming to me uniquely for ball rolling now. This is why I endorse this product: everyone who uses them gets some benefit. You can&apos;t ask for more than that! I use the orange balls every day for rolling tension out of my own body. They are a great, general purpose ball - they roll easily and feel great. My clients love them! We keep several sets of the balls in the studio for use in group classes. 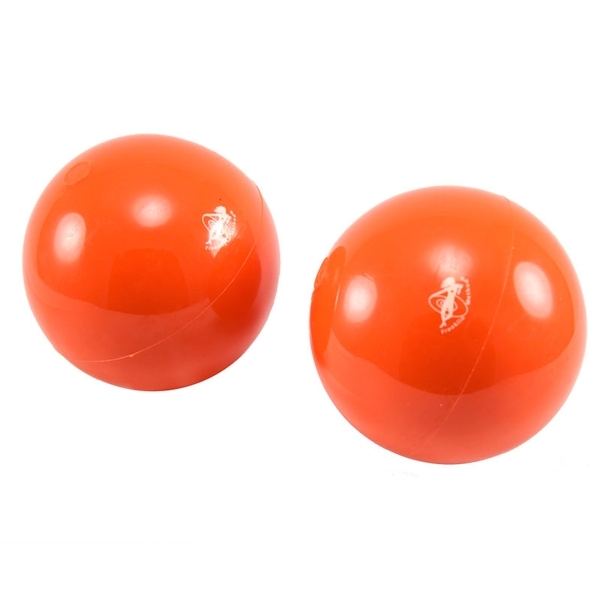 The smooth balls work well for supine exercises because they roll on the mat and over the clothing without sticking. These balls can be adjusted for relative firmness to suit individual students. Once students feel the benefits of the balls, they usually want to purchase a set for home and travel.